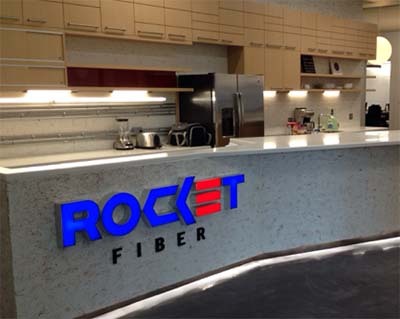 Detroit-based Rocket Fiber, a new gigabit Internet network that provides up to 10-gigabit speeds for residential customers and up to 100-gig speeds for businesses, today opened its headquarters on Woodward Avenue in downtown Detroit. Foster says the headquarters are located within the 48,000-square-foot Albert Kahn-designed Bedrock building at 1505 Woodward Ave and across from the John Varvatos store. The space was designed by Detroit-based architectural firm Rossetti and the Detroit-based office design firm dPOP!. Construction was managed by Detroit-based Sachse Construction. Rosetti’s Tony Reiner, the lead designer of the project, says the space has an open workspace, a centrally located kitchen, and a sky-blue ceiling in the lobby. Rocket Fiber was founded about 18 months ago and has 30 employees. The company will begin offering its service to residential and commercial customers in Detroit. The service offers residents the ability to download a one-hour and 40 minute movie in 40 seconds.